1 Fire Safety Policy/Procedures Contents: Fire Safety Policy 1. General Statement 2. Employees Duties 3. Communication 4. Procedures 5. Emergency Evacuation Plan Fire Marshals: Abon: Mark Calland, Lauren Hyde (currently on maternity leave, covered by Freya Palmer), Pete Clark Pembroke: Clare Hutton, Ian Saint, John Duncan Pete Clark/Clare Hutton are responsible for ground, first and second floors in respective buildings and Mark Calland/Ian Saint are responsible for the lower ground floors Mark Calland/Clare Hutton are responsible for phoning and liaising with the fire brigade. 1. 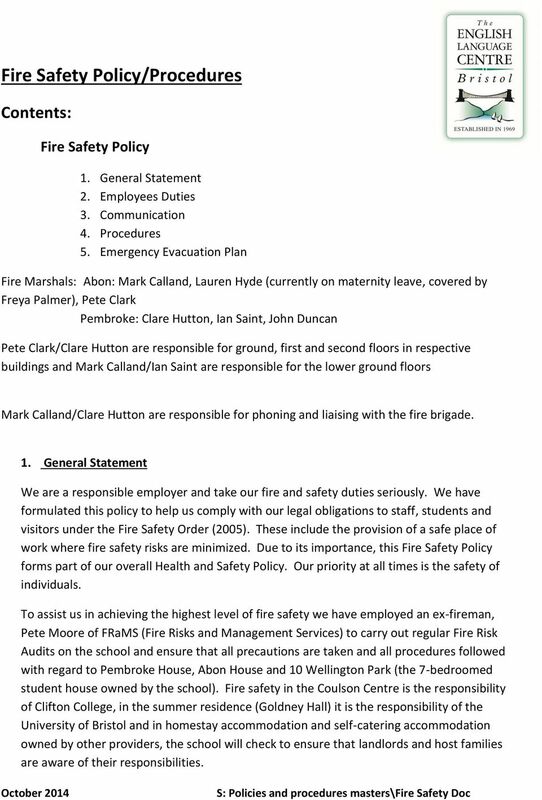 General Statement We are a responsible employer and take our fire and safety duties seriously. 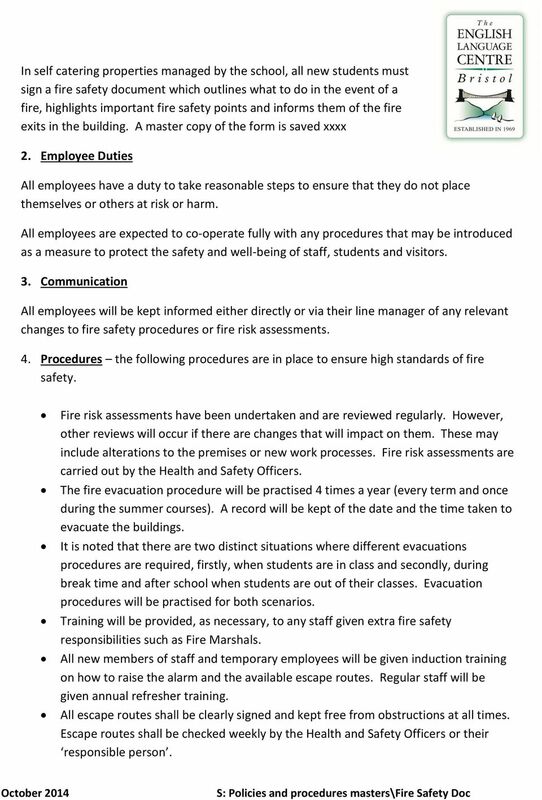 We have formulated this policy to help us comply with our legal obligations to staff, students and visitors under the Fire Safety Order (2005). These include the provision of a safe place of work where fire safety risks are minimized. Due to its importance, this Fire Safety Policy forms part of our overall Health and Safety Policy. Our priority at all times is the safety of individuals. To assist us in achieving the highest level of fire safety we have employed an ex-fireman, Pete Moore of FRaMS (Fire Risks and Management Services) to carry out regular Fire Risk Audits on the school and ensure that all precautions are taken and all procedures followed with regard to Pembroke House, Abon House and 10 Wellington Park (the 7-bedroomed student house owned by the school). Fire safety in the Coulson Centre is the responsibility of Clifton College, in the summer residence (Goldney Hall) it is the responsibility of the University of Bristol and in homestay accommodation and self-catering accommodation owned by other providers, the school will check to ensure that landlords and host families are aware of their responsibilities. 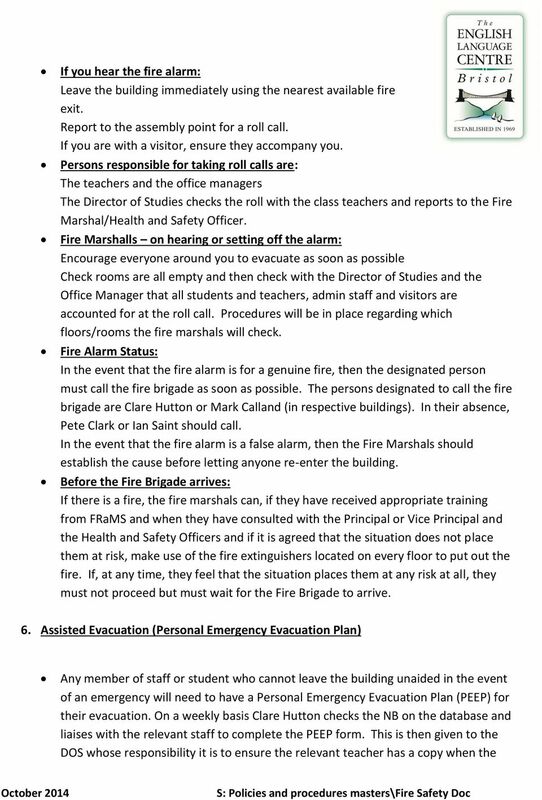 2 In self catering properties managed by the school, all new students must sign a fire safety document which outlines what to do in the event of a fire, highlights important fire safety points and informs them of the fire exits in the building. A master copy of the form is saved xxxx 2. Employee Duties All employees have a duty to take reasonable steps to ensure that they do not place themselves or others at risk or harm. All employees are expected to co-operate fully with any procedures that may be introduced as a measure to protect the safety and well-being of staff, students and visitors. 3. Communication All employees will be kept informed either directly or via their line manager of any relevant changes to fire safety procedures or fire risk assessments. 4. Procedures the following procedures are in place to ensure high standards of fire safety. Fire risk assessments have been undertaken and are reviewed regularly. However, other reviews will occur if there are changes that will impact on them. These may include alterations to the premises or new work processes. Fire risk assessments are carried out by the Health and Safety Officers. The fire evacuation procedure will be practised 4 times a year (every term and once during the summer courses). A record will be kept of the date and the time taken to evacuate the buildings. It is noted that there are two distinct situations where different evacuations procedures are required, firstly, when students are in class and secondly, during break time and after school when students are out of their classes. Evacuation procedures will be practised for both scenarios. Training will be provided, as necessary, to any staff given extra fire safety responsibilities such as Fire Marshals. All new members of staff and temporary employees will be given induction training on how to raise the alarm and the available escape routes. Regular staff will be given annual refresher training. All escape routes shall be clearly signed and kept free from obstructions at all times. Escape routes shall be checked weekly by the Health and Safety Officers or their responsible person. 5 student is in their class. It is the responsibility of the teacher to assist the evacuation of the student in accordance with the PEEP. Completed PEEP forms are kept in the fire safety folder. 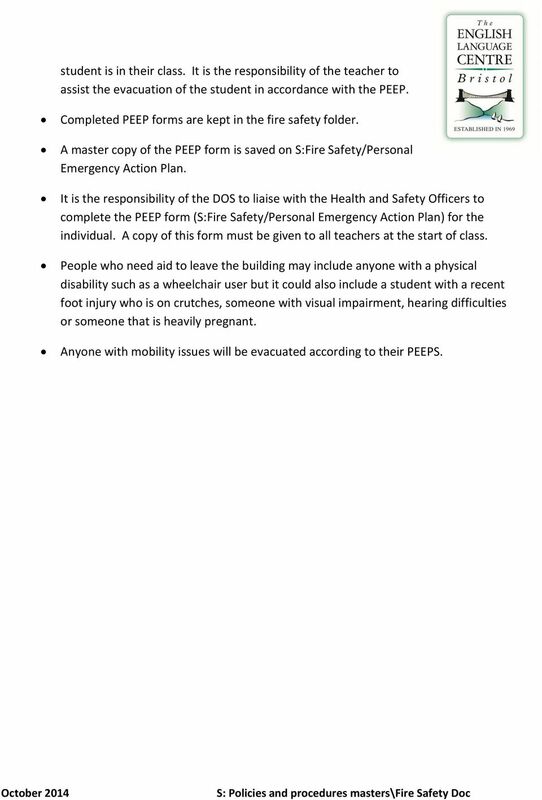 A master copy of the PEEP form is saved on S:Fire Safety/Personal Emergency Action Plan. It is the responsibility of the DOS to liaise with the Health and Safety Officers to complete the PEEP form (S:Fire Safety/Personal Emergency Action Plan) for the individual. A copy of this form must be given to all teachers at the start of class. People who need aid to leave the building may include anyone with a physical disability such as a wheelchair user but it could also include a student with a recent foot injury who is on crutches, someone with visual impairment, hearing difficulties or someone that is heavily pregnant. Anyone with mobility issues will be evacuated according to their PEEPS. 1.1.4 The findings from Fire Risk Assessment must be incorporated into the FRAMS Action Plan to manage fire safety at each premise. Fire alarm bells (and associated fire detection equipment) are tested on Wednesday mornings between 0830-0845. 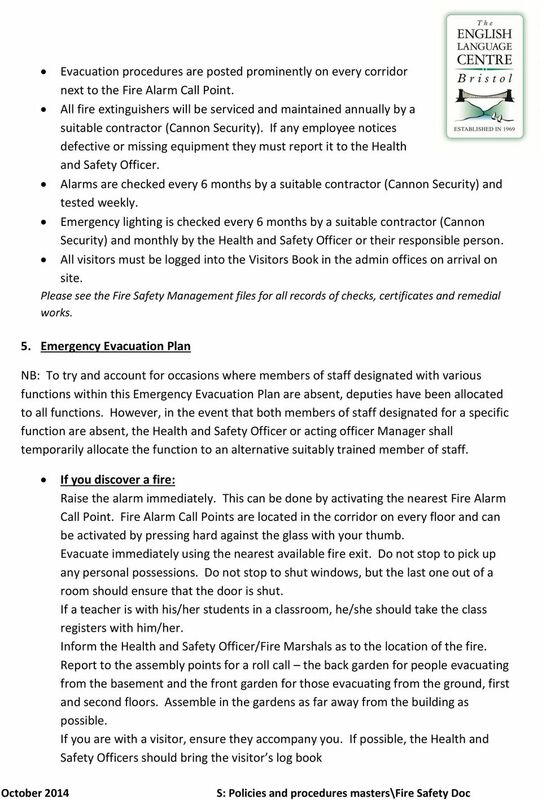 Fire Policy and Procedures Cañada Blanch Spanish School SUMMARY 1. Introduction (p. 3) 2. Roles and responsibilities (p. 3) -- Headteacher -- Fire Team -- All staff -- Contractors 3. Fire procedures (p.
CJ s health and Safety Law poster is displayed in the staff lobby. These Procedures cover all non residential buildings owned, leased or occupied by The Robert Gordon University. Emergency and Disaster Recovery Plan To include EYFS This policy reflects GEMS current guidelines and practice. GEMS is not liable for any error in print or otherwise. Last modified 18 April 2013 by I. BASIC HEALTH AND SAFETY POLICY 1 In the following pages is an example of a basic health and safety policy. The text in the square brackets [ ] provide instructions on how to complete any gaps in the policy. FIRE SAFETY MANUAL. Table of contents can be found on the left side of this document. Checklist for Educational Premises Name of Premises: Address of Premises: Name of Responsible Person: What area / location does the assessment cover? Does the assessment cover the whole school YES or NO? Holy Cross College POLICY DOCUMENTS. procedures in order to act in a competent manner in the event of an evacuation. Following a significant change in information or after five years. PEEP Policy. Various fire safety-related guidance and training.